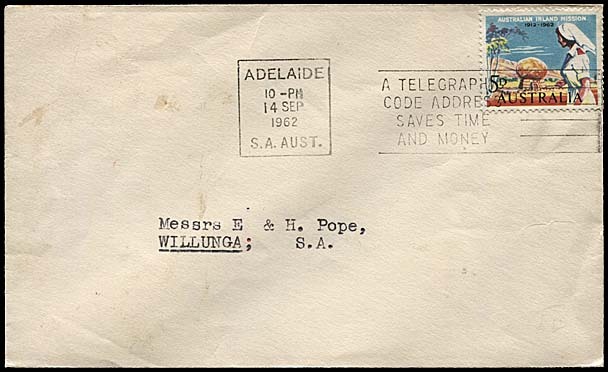 Slogan cancellations: A Telegraphic Code Address Saves Time and Money. 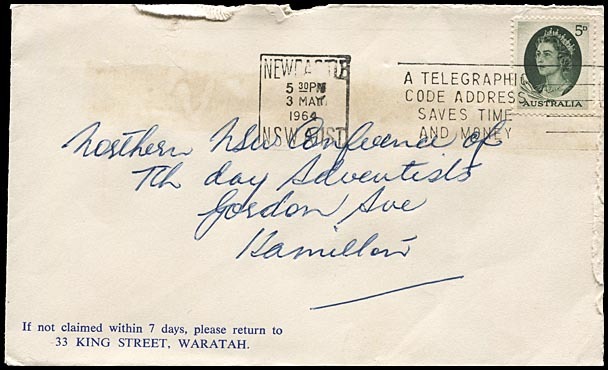 was introduced at all six main Post Offices during the week commencing 11 June 1961 and subsequently at three other offices - Canberra, Launceston and Newcastle. 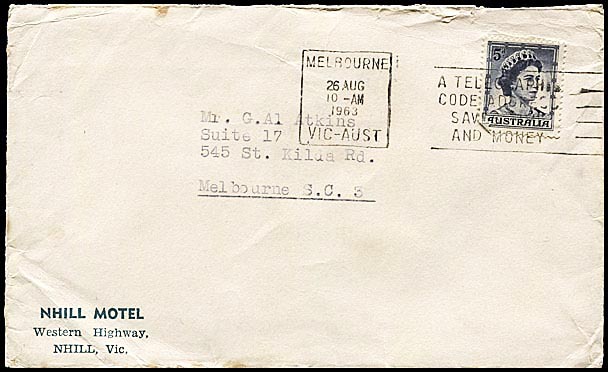 13 June 1961 at Brisbane and Melbourne. 1 May 1974 at Hobart. Some writers (e.g. Occleshaw) note that this slogan was withdrawn from use by mid-1975. Others note the latest year was 1969. The slogan was 20 mm high and incorporated letters 2 mm high. The slogan was used in nine Offices and 137 examples are included in the Census so far. Details of the main variations in format for each Office using multiple dies, including die variations and code numbers and posting details, are accessed by the hyperlinks. 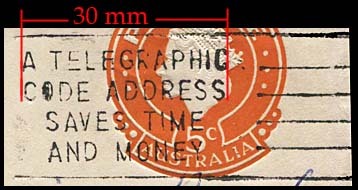 There appear to be two distinctive dies for the TELEGRAPHIC CODE ... slogan - in addition to the use of circles or boxes and the inscriptions at the base therein. These dies are identified by the length of the first line. 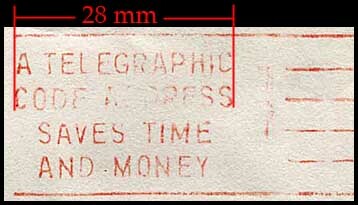 Die 1: the first line is 30 mm long and the letters at each end are outdented just beyond the ends of the line below. the most common die - used in about 70% of examples in the Census. known at all Offices using this slogan cancellation except for Perth where details of only one example are recorded. 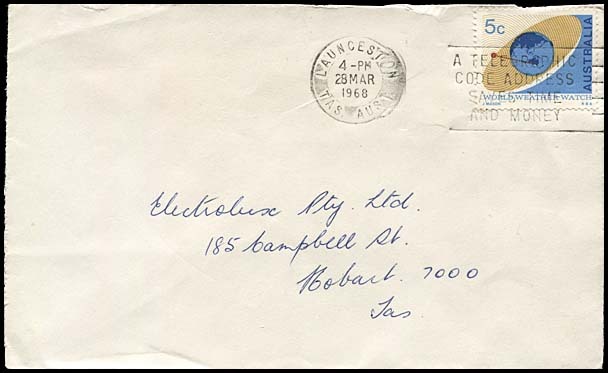 Example: Hobart Box 30 August 1970. Die 2: the first line is 28 mm long and letters at each end are indented from the ends of the line below. 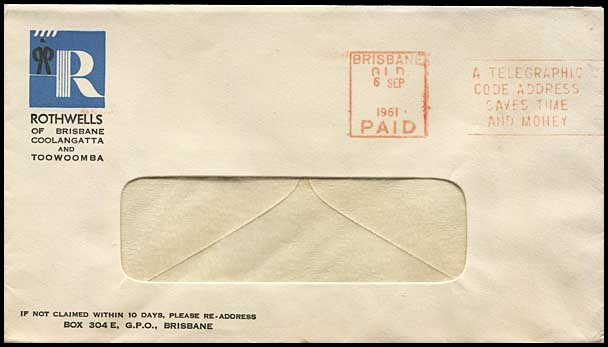 appears to have been a later change about 1968 except for one example for Brisbane used in 1966. 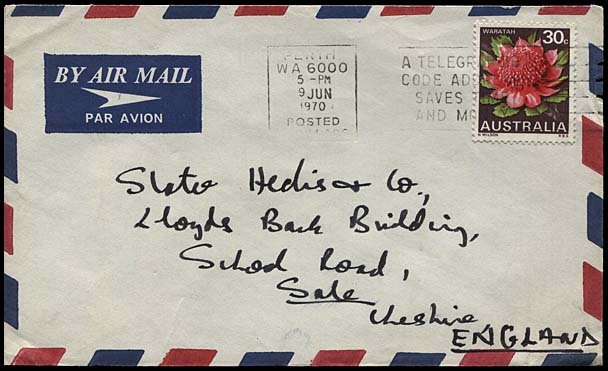 Example: Adelaide Box 25 May 1971. 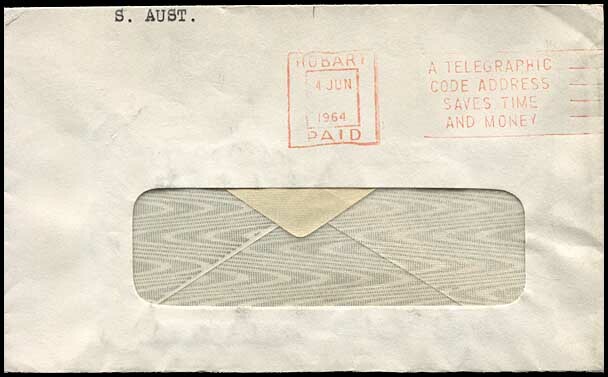 13 June 1961 (2 days after introduction). 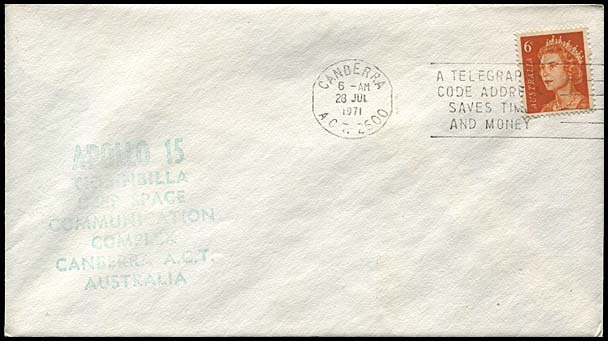 Only date recorded for this format: 28 July 1971.
it had been withdrawn by 11:30 pm on 19 May 1971. Return to Slogan overview page.